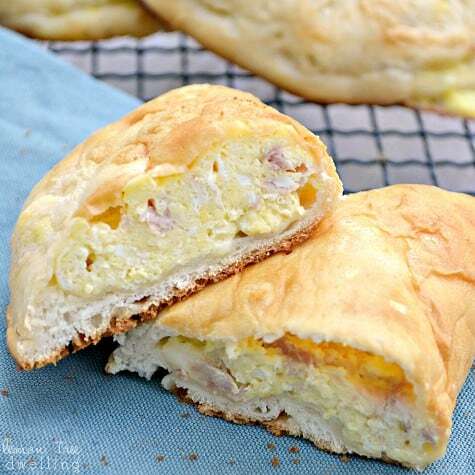 Ham, Egg & Cheese Breakfast Pockets – a delicious breakfast you can eat with your hands! 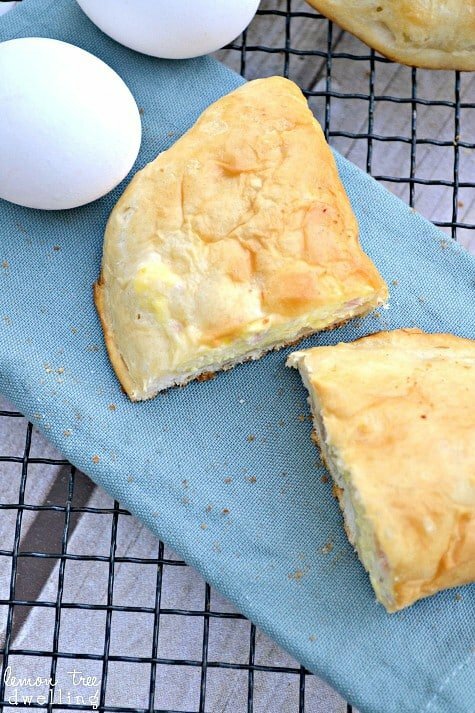 Perfect for a busy morning or breakfast on the go! It has come to my attention that breakfast time around here need some serious work. And yes, I admit, I’ve been getting into the habit of offering either toast or cereal for breakfast….every morning. And yes, of course, I knew it was only a matter of time before the troops rallied against me. Well, that time has come! There has been a serious uprising here at our Lemon Tree Dwelling, to the point where it’s been making us nearly late for school because no one wants to eat their breakfast!! Clearly something needs to change. So….a few mornings ago I decided to make muffins. And, no surprise, the kids loved them! LOVED them! Ellia ate 4 (yes, FOUR) of them…and Greta and Nora each had 2. Definitely a success. And then I decided to try something a little different – something I knew I’d feel GREAT about my kids inhaling, if they happened to like them enough to inhale them. 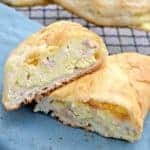 I decided to try these easy breakfast pockets. And……. Lo and behold, they were a huge hit, too! Greta actually wanted to eat them for breakfast, lunch, and dinner….that’s how much she liked them. And everyone else was excited to have such a delicious breakfast option they could eat with their hands!! Perfect for little girls who like to run around in the morning, husbands who like to eat in their car, or busy moms who are trying to get everyone else ready while also eating something for breakfast, themselves. And best of all, they can be made fresh in about 20 minutes OR re-heated in the morning if you make them the night before. A deliciously easy, healthy, kid-approved breakfast option. You’re welcome. 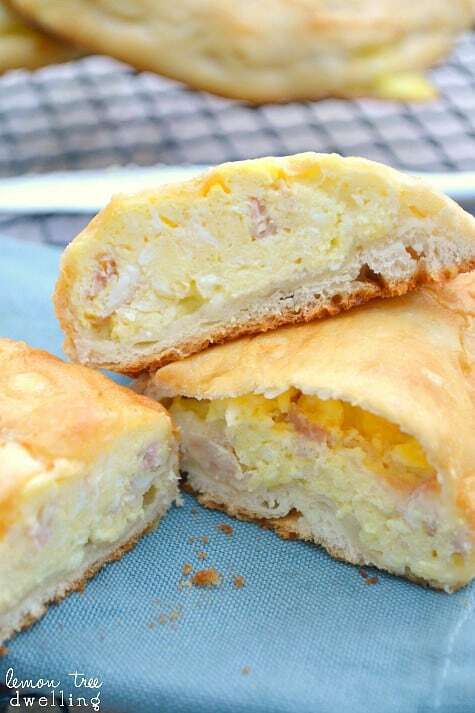 Ham, Egg & Cheese Breakfast Pockets - a delicious breakfast you can eat with your hands! Lightly spray two large baking sheets with cooking spray. Place 4 biscuits on each baking sheet and spread dough to form 6 inch rounds. Set aside. Divide mixture evenly among dough rounds (approx. 1/3 c. each), keeping eggs to one half of each round. 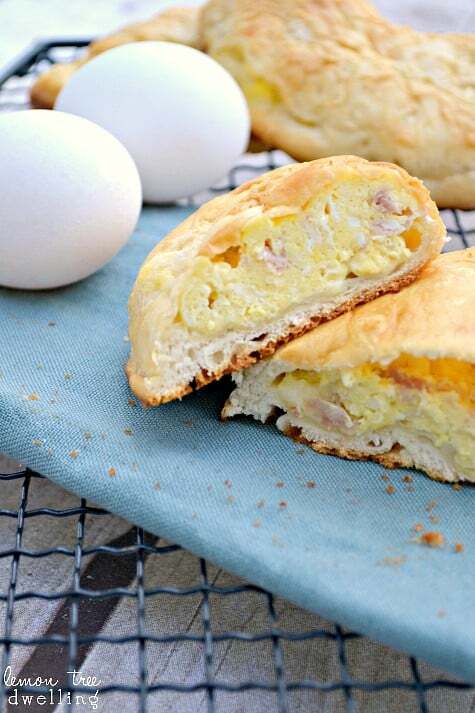 Fold remaining half of dough over scrambled egg mixture to create a half-circle; seal edges with a fork. 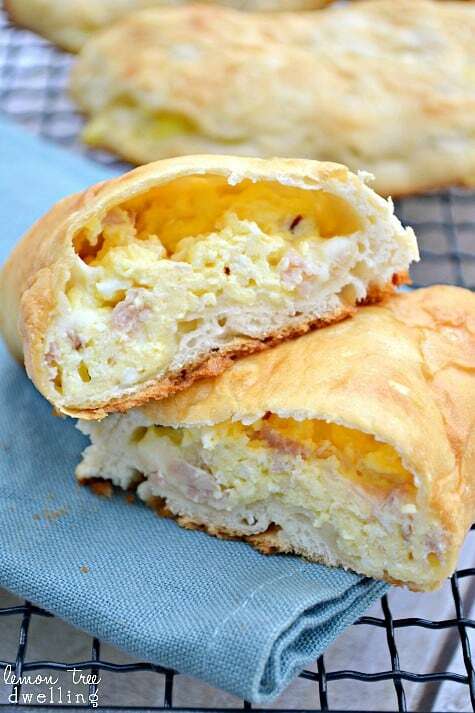 Be sure to check out these other delicious breakfast recipes! 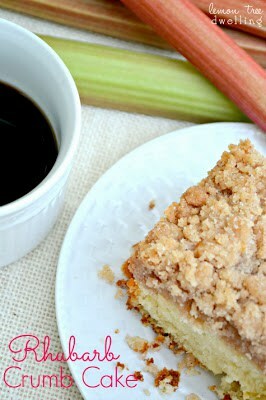 I’ll be making this for sure! Thanks for the recipe! 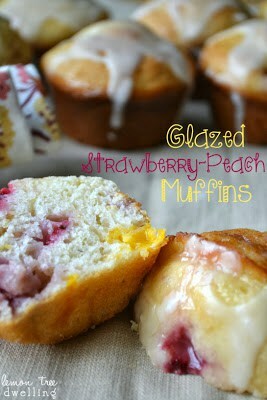 What a great idea – look easy and delicious! 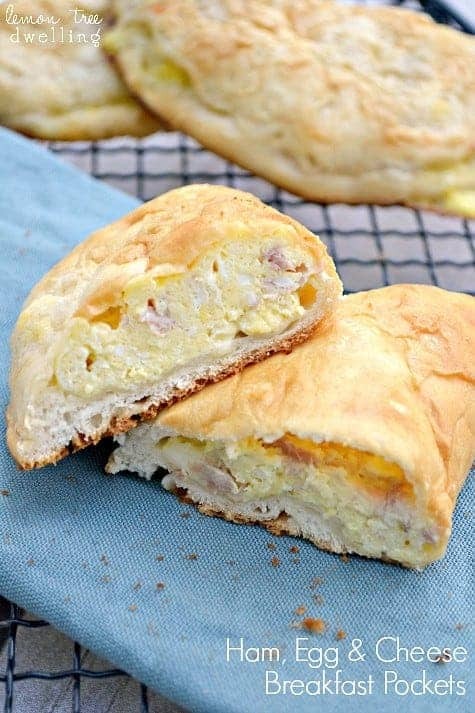 These look delish – perfect for our Columbus Day lazy morning – thank you! Has anyone ever frozen these? Thought it would make a great on the go breakfast. Great idea, Emma! I haven’t tried freezing them, but I would imagine it would work just fine. 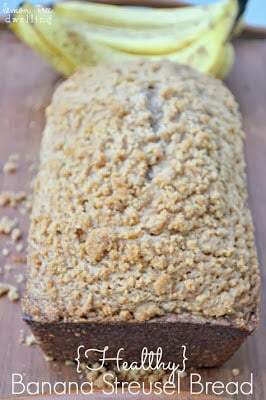 I’ll give it a try and update the recipe with notes soon!! Thanks for stopping by! 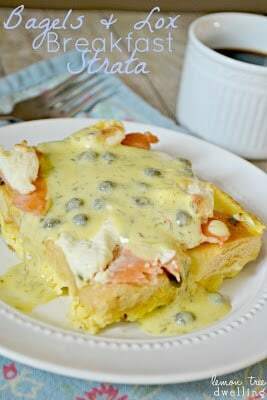 I’m always looking for breakfast to cook ahead of time to bring to work for the week. If I were to freeze these what do you think the best way to heat them would be?